Birger Kollmeier, PhD, is being honored with the American Academy of Audiology International Award due to the strong contributions he has made to audiology in English and non-English-speaking countries. He has had a very strong influence and made outstanding contributions to hearing science, psychophysics, auditory electrophysiology, hearing aid development, and evidence-based hearing aid evaluation. Prior to his current appointment that began in 1993, as a full professor in experimental and applied in physics at the University of Oldenburg, Dr. Kollmeier gained broad and extensive experience in research and academia. His early educational experience includes receiving a PhD in physics (1982), a PhD in medicine (1986), and the award of a Fulbright Scholarship with a one-year research visit to St. Louis, USA (1982). He ably worked his way through the academic ranks of assistant and then associate professor from 1986 to 1992 at Göttingen University. Dr. Kollmeier is well-known and held in high esteem by his peers in Germany and internationally, and is chair of the German Audiological Society. Since 2000, Dr. Kollmeier has been the chair of the International Graduate School, Neurosensory Science and Systems, and is also chair of the National Center of Excellence in Biomedical Engineering. His practical approach to hearing sciences has led to advances in audiology, digital signal processing for hearing aids, speech intelligibility testing in German language, and diagnostics. In fact, the research group he leads in the medical physics section at the University of Oldenburg, was one he originally founded 22 years ago, that focuses on multidisciplinary knowledge of the auditory system to improve hearing aids. In addition to his notable successes, Dr. Kollmeier has supervised several PhD candidates who have become industry and academic leaders. 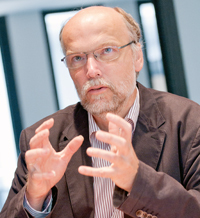 His extensive publications span three decades and cover a wide range of topics that have expanded the scientific body of knowledge not only in Germany but also worldwide. Several of his ideas have found their way into state of the art hearing instruments and have been patented. With this extremely strong background, Dr. Kollmeier is very deserving of the honor of the International Award from the American Academy of Audiology.